HDMI is not a new term and you may have used an HDMI cable to connect your TV to various sources. HDMI stands for High Definition Multimedia Interface. It is used for transmitting uncompressed video data and compressed or uncompressed digital audio data from an HDMI-compliant source device to a compatible device. It offered High definition video transmission with a connector just a little bigger than a standard USB plug. HDMI replaced the bulky SCART connectors and confusing component video cables. Development of HDMI began in 2002 and it went on sale in 2003. It also saw several improvements in recent years. As the needs of televisions have changed, new features have also been added to it. But HDMI is now set for a bigger than ever upgrade with new HDMI 2.1. The most recent HDMI specification was 2.0 that included lossless audio codecs along with metadata for HDR and HLG. Now the HDMI 2.1 is set to be available with lots of features that will change the current state of your home cinema. The bandwidth of HDMI cable has been increased from 18Gbps to 48Gbps. It allows more data to be passed. Here are the features added in HDMI 2.1. 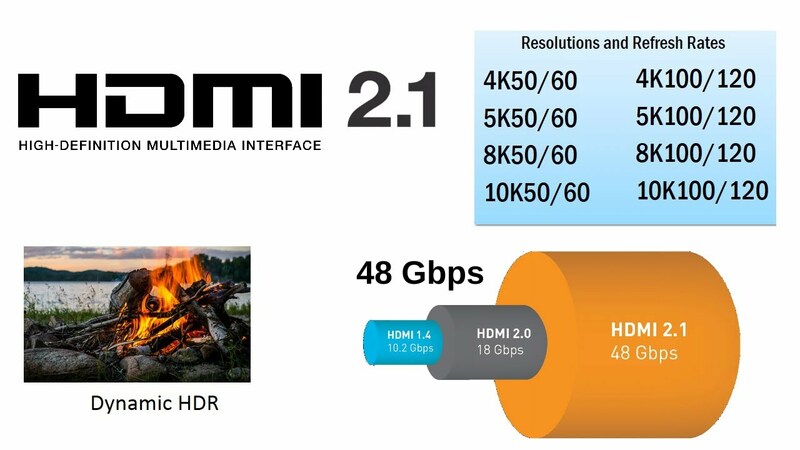 HDMI 2.1 adds support for various resolutions and frame rates from 4K/50fps to 10K/120fps. Now you may wonder why to add support for this much of high resolution and higher frame rates when most of you are still watching content on HD and very few people have access to 4K capable sets. The reason is simple. To make this tech futuristic. Japanese public broadcaster NHK will broadcast Japan 2020 Summer Olympics in 8K. Other cable operators and streaming services are also expected to adopt 4K and 8K in the coming years. We can also expect the launch of a few TV models supporting 8K. Even if all these things will be out of reach of most people, for now, the HDMI 2.1 will ensure that we have a standard for supporting the future. HDR stands for High Dynamic Range that creates an image with a wider color palette and more varied tones. The dynamic HDR sets values for contrast scene-by-scene or even frame-by-frame. Dolby Vision HDR and HDR10+ belong to dynamic HDR. HDMI 2.1 also allows HDR to be beamed at 4K/120 and 8K/60 video. It also ensures future compatibility for the format. Increased refresh rate will also help video games where higher refresh rates lead to more responsive gameplay. VRR of Variable Refresh Rate keeps the refresh rate of a display synchronized with the variable frame rate of a video game. So, it produces a smoother performance. Quick Frame Transport (QFT) allows frame rates to transmit from the source faster resulting in lag-free gaming. So, HDMI 2.1 will help in bringing fluid gameplay experience in real-time virtual reality games. Quick Media Switching refers to switching between HDMI-connected devices. 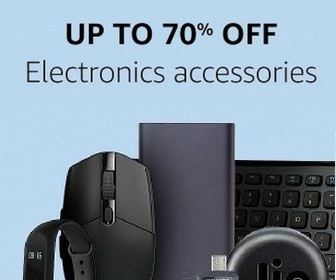 It will make switching between the devices attached to your television faster than ever. ARC stands for Audio Return Channel. The HDMI connection transfers audio data from your TV to a soundbar or AV receiver. The eARC is the update to ARC for supporting object-based audio surround formats such as DTS:X and Dolby Atmos. It means your TV’s media apps can now send data directly to your AV receiver. But the eARC is now backward compatible with ARC. SO, manufacturers will have to ensure that new devices support both ARC and eARC compatible for legacy support. There is another important thing you should know. HDMI 2.1 cable is designed to be backward compatible. So, your older cables will work with 2.1-enabled products but that won’t offer the benefits that HDMI 2.1 brings. You can read more about HDMI 2.1 here. Do you really need HDMI 2.1? No, Not year. None of your current TV ranges are compatible with HDMI 2.1 and there are very few products that support this new standard. After the new standard is available officially, we can expect 2019 to see several new devices supporting this. TV manufacturers will look to support it, but most of the devices will not be cheap. HDMI 2.1 will surely improve the whole home cinema ecosystem including TVs, soundbars, game consoles and more. But this change will not be at sudden.